This is the sort of food that makes me do the happy dance. Literally. I took a massive spoonful and was jumping up and down with glee. It was everything I had hoped it would be, and more. Non foodies will find it hard to understand the elation you feel when you make something that is this good. I mean, gravy even in its most basic form (and anything you smother in gravy) is fantastic. 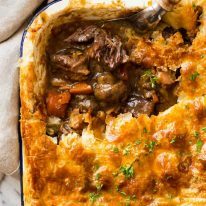 But with this Chunky Beef and Mushroom Pie, with just one bite, you know it’s a step up from the usual pie. You may not be able to put your finger on it, but you know there’s something different about it – just better. 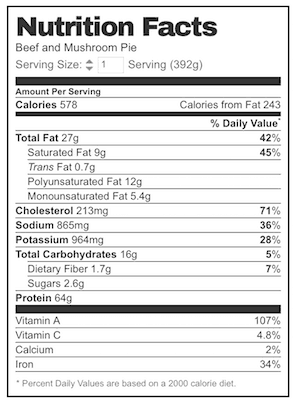 This is the secret ingredient – Dried Porcini Mushrooms. 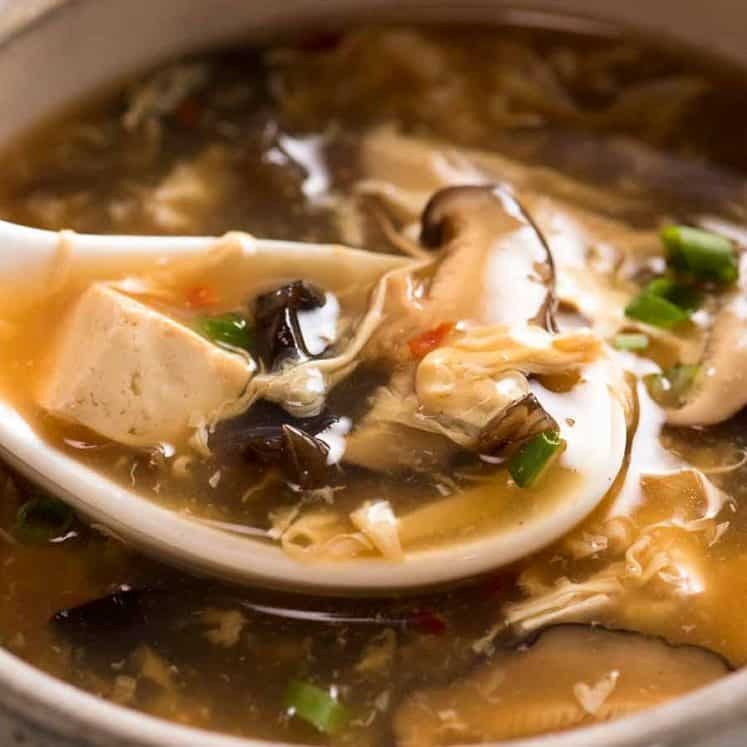 Just a tiny amount adds a punch of savouriness and earthiness – in posh foodie language, it adds umami. b) ALDI SPECIAL BUY *** ALDI SPECIAL BUY *** ALDI SPECIAL BUY!!!! About 5 years ago, back when I was in corporate, a group of my colleagues were talking animatedly about the ALDI Special Buys for that week (which, from memory, was ski gear at insanely good prices). There they were, a group of professionals, all dressed up in suits and heels and I couldn’t believe that they were so excited about it that they lined up at ALDI just to get the deal!! I had clearly missed the ALDI train. I am now a firm regular on the ALDI train. (And yes, there are always lots of caps and exclamation marks). 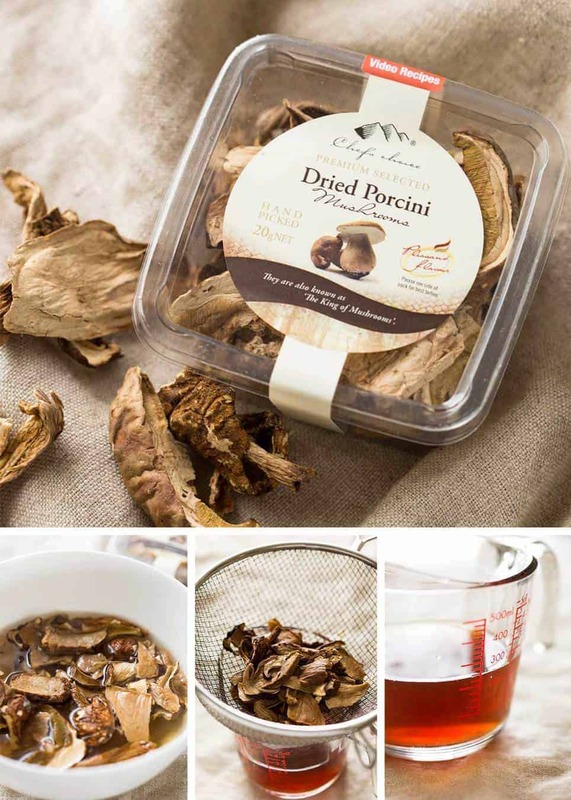 Dried Porcini Mushrooms are like a secret weapon stock. 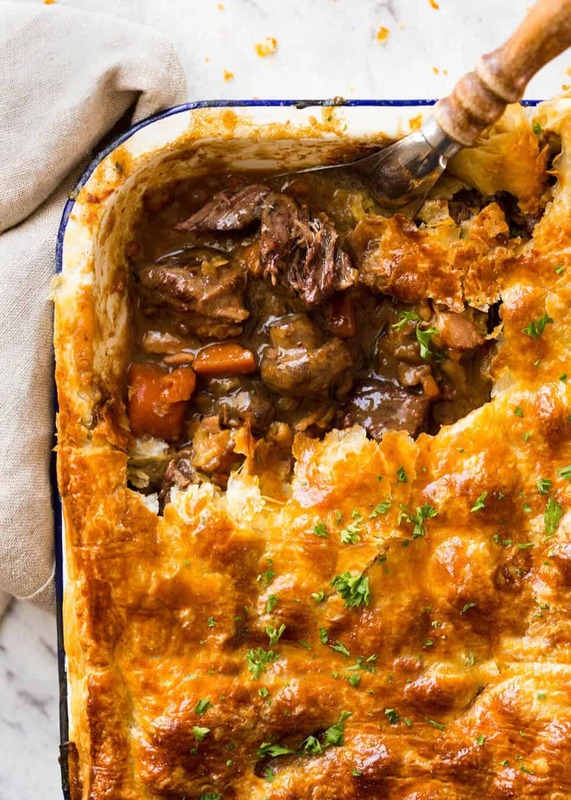 And I used it to make this Chunky Beef and Mushroom Pie because it makes the most incredible gravy sauce ever. 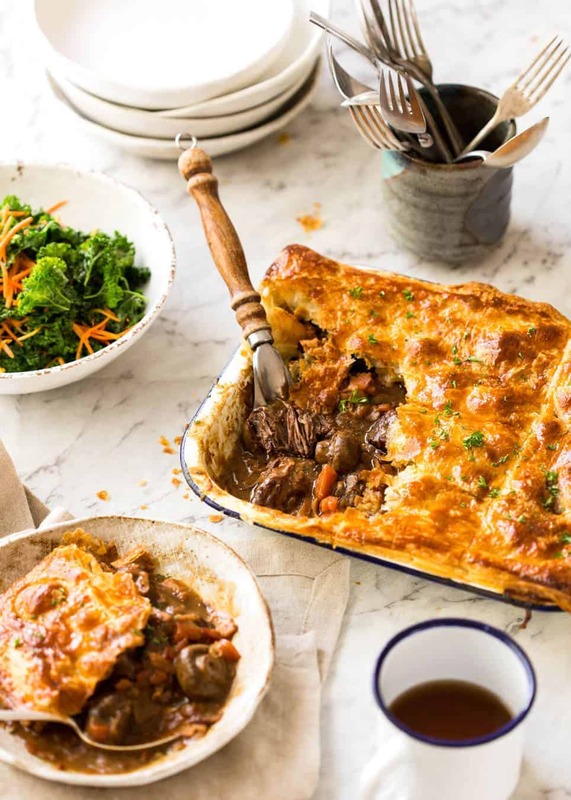 Topped with some flaky, golden puff pastry (yes, I know it looks crazy yellow but that’s how it comes out if you brush with egg yolk)……and that moment when you break through that pastry to reveal the tender, fall apart beef and the smell of that savoury extra-tasty-gravy…. Well, let’s just say you should prepare to swoon. 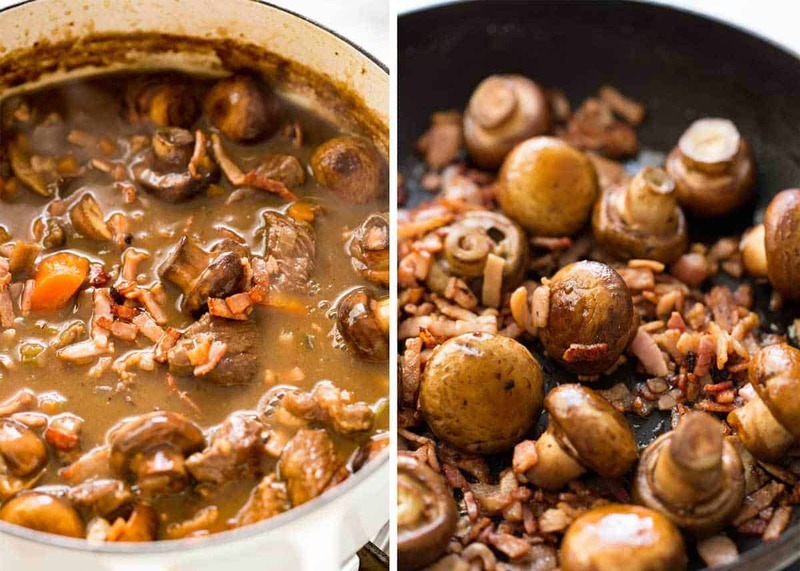 Tender, fall apart chunks of beef with mushrooms in the most incredible gravy ever. The secret ingredient - Dried Porcini Mushrooms! They add a savoury earthiness that can't be replicated and takes this pie to the next level. 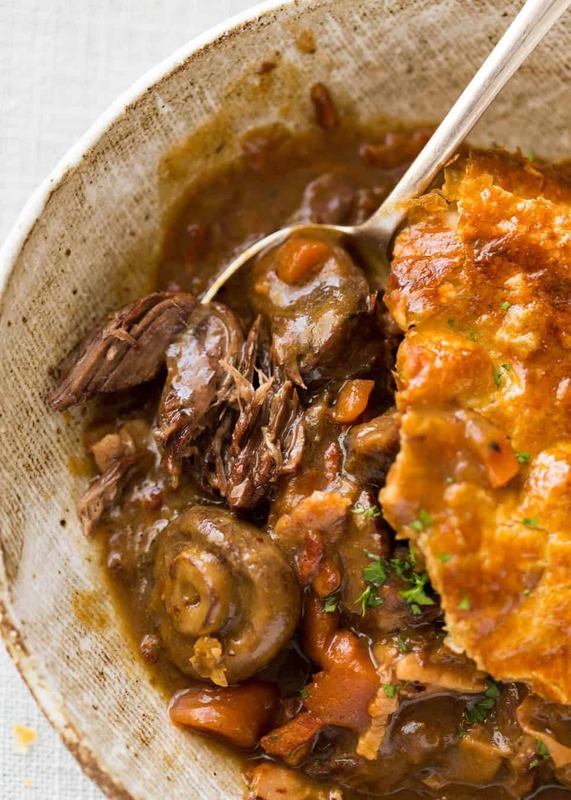 Pour stew into a pie dish, even out surface. Pictured pie dish is 24 x 20 x 4.5 cm / 10 x 8 x 1.8" (1.5L / 1.5 Qt) - see Notes for more conversions. 1. Dried porcini mushrooms add a savoury earthiness to the gravy. In nerdy food terms, it's called "umami" and it really takes this pie to the next level. However, even if you can't get a hold of it, it is still very much worth making this pie. Or try using other dried mushrooms! 3. 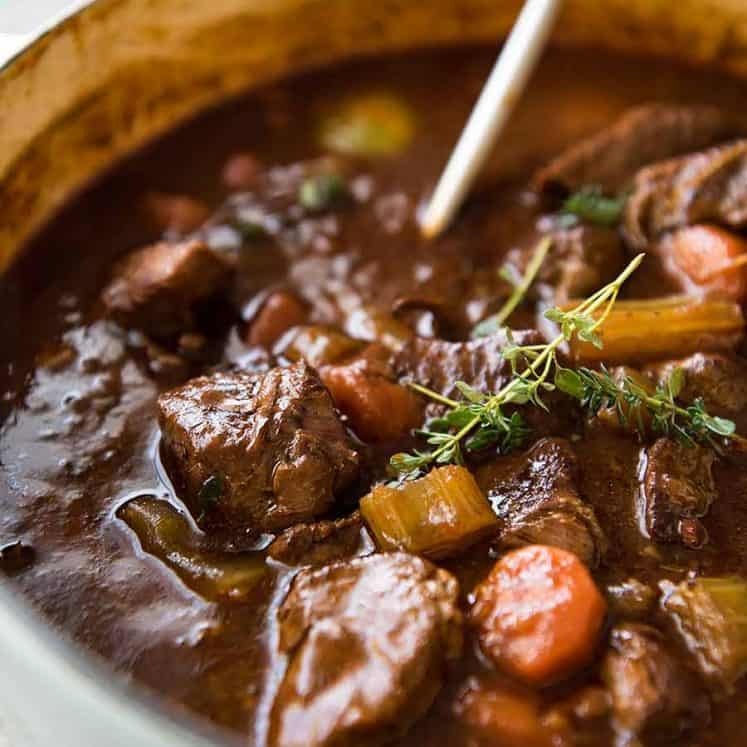 SLOW COOKER: Skip the beef broth and use 2 x crumbled beef stock cubes instead. Follow recipe up to step 7 then transfer everything into a slow cooker (liquid might not cover everything, that's ok). Slow cook for 6 hours on low, or 3 hours on high. Then add cooked bacon and mushrooms, slow cook for another 45 minutes or do this step on the stove. If the liquid did not thicken to a thin gravy, simmer it uncovered on the stove. When it cools, the sauce thickens more. 4. Pie Dish: It's ideal to have a pie dish where the filling comes up to the top or even protrudes slightly (though liquid should be at or just below rim) so the puff pastry sits nicely on top. However, it's not the end of the world if your dish is not the right size! Pictured pie dish is 24 x 20 x 4.5 cm / 10 x 8 x 1.8" (1.5L / 1.5 Qt). A 20cm/8" square pan is also a good size, as would be a large or deep pie dish around 23 cm / 9.5" x 4cm / 1.8" high. Also, this is fantastic to make in individual ramekins (that's what I do if I have a bit left over, using puff pastry scraps). 5. STORAGE: As with most slow cooked things, tastes even better the next day so in my perfect world, I make the filling the day before then cool overnight. To prepare ahead for fridge, thaw then top with puff pastry, keep in the fridge for up to 2 days. Technically, thawed puff pastry kept in the fridge for a while puffs a wee bit less but it's not noticeable to me unless lined up side by side. The filling freezes great as does the filling with raw puff pastry on top (thawed then refrozen puff pastry also puffs a teeny bit less, but does not stop me). Always thaw before baking. For all make ahead scenarios, brush with egg just before baking. 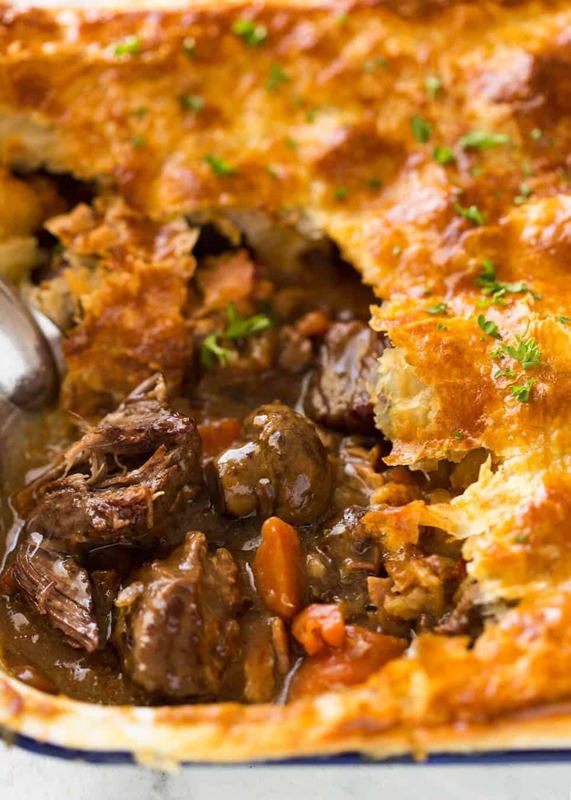 EPIC Chunky Beef and Mushroom Pie recipe video! Always happy. Playing. Sleeping. Or eating. i.e. 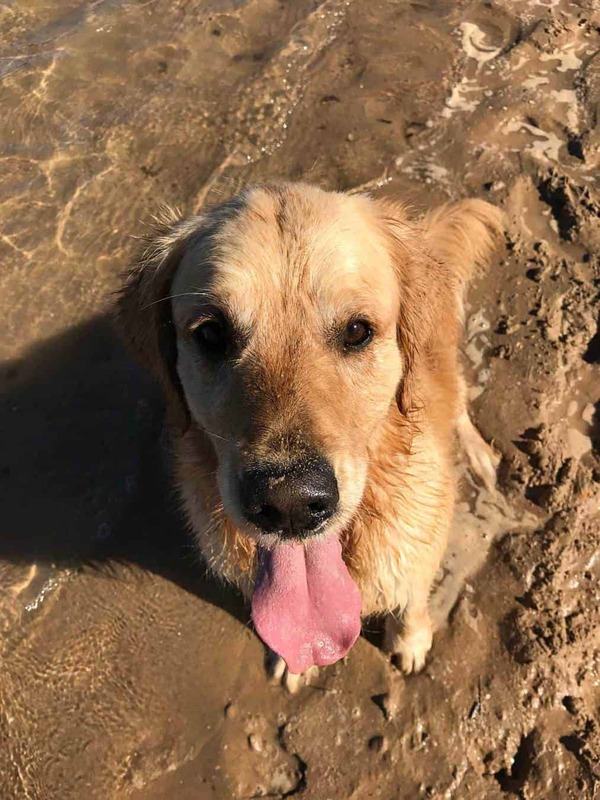 Always happy. This sounds amazing however not a fan of any kind of mushrooms. Can you make without them? Hi Danielle, you sure can!